Does the front door have to be open when I am getting my carpets cleaned? Getting the fuzz balls off your upholstery can be a challenge. Using a fabric shaver to do this makes it a lot easier, When we clean your upholstery, we always use a fabric shaver on the cushions to get rid of all the pilling on the upholstery. This happens when there is wear on the fabric like the sides of the cushions, where they rub together. Fabrics like wool, cotton, polyester, nylon and acrylic do this more because of the short fiber strands and linen and silk do this less because the fiber strands are longer. Also, knitted fabrics pill more than woven fabrics. You can get this fabric shaver at amazon, they are only around twenty dollars. This is something you can do while you are watching television or Netflix. Alpine Professional Carpet were amazing. My husband has severe allergies. Alpine came in and not only cleaned our carpet but they added an allergen treatment that worked great for my husbands allergies. They are very professional and I would highly recommend them to anyone! Take a hike to Horsetail Falls . Horsetail Falls trail head is in the very north east end of Alpine Utah it is the Dry Creek Trail Head. The hike is about 2.1 miles long but it is worth the hike. It is best to take this hike in the spring time when the water is flowing more. It is a steep hike and you will gain 1,600 feet in elevation. Take a hike to Lake Hardy. This is a very hard hike and you better make sure to take plenty of water. You gain about 5,000 feet in elevation and the trail head is in the very north of Alpine Utah. This is an all day hike so start early in the morning and bring food and water. It is best to do this hike in the spring time and the fall when it is not so hot. Mountain biking. For a easy ride you can start a the Rodeo grounds and ride through Lambert Park and the trail keeps going . (Lambert Park is 255 acres) and for a harder ride you can start on the ridge of Draper and there is a trail that takes you down to Alpine Utah. There are trails that take you all over Alpine. Deer hunting. In the late summer the deer hunt starts. First the bow hunt , then the muzzle loading hunt, then the rifle hunt . You can hunt the mountains around Alpine Utah but you have to be on the national forest and away from any homes. Alpine Days. There are a lot of things to do for Alpine Days but the things I like to do the best is the rodeo, the parade, the fire works and listening to live music at the carnival. You will see everyone that lives here at Alpine days. Tennis. There is two places to play tennis in Alpine Utah , Creekside Park and Burgess park. Snoasis. On a hot summer night you can go to Snoasis to get a snow cone and you will run into people you know that live here. It is the thing to do on a hot summer night, have a snow cone and talk to friends. The Splash pad at Creekside Park. On a hot summer day you can take your kids to Creekside Park, play tennis, basketball, ride skateboards, play on the grass field and play in the splash pad at the park. You can also play sand volleyball. There is also play grounds and picnic tables all over the park. Food trucks in the park. On Monday evening, during the summer, they have food trucks in the park and sometimes they have a live band that will play on a summer night, great fun with family and friends. Alpine Art Center. The Alpine Art Center is an art gallery, they also have wedding receptions and corporate events there. Taking family pictures. In a short period of time, in the spring, the poppies bloom in Lambert Park and that is a great time to have your pictures taken and you can also go to Peterson Park and have your pictures taken by the bridge, or you can go up Dry Creek Trail Head and have your picture taken by the river side. Watching the wildlife here in Alpine Utah. We see deer everyday, here in alpine and lots of other wildlife and that is one of the main reasons I like living here. The first thing is to put water in the iron and put is on steam. Then get the white towel wet and wring it out. Then put the damp towel on the wax spot and make the wax soft by putting the hot steamy iron on top of the towel, then take a butter knife and scrape the wax that is on top of the carpet. Then put the towel and the iron on top of the towel over the spot and the towel will absorb the wax. You will have to keep the towel moving around until it absorbs all the wax in the carpet. I would do this with a cheap towel because you will want to throw it away when you are done. Some people do this with a brown paper bag but the towel works better and the brown paper bag has lettering on it sometimes and the lettering can bleed on to the carpet and that is hard to get out. If the wax has a color in it, the wax might dye the carpet, then you will have to do the same thing but you will have to use Red Relief by Pro's Choice Supply. When you are all done mist the spot with water with a trigger sprayer and vacuum with a shop vacuum, Then set a small fan next to the spot to dry the carpet. If some of the wax spills on the wall you can wrap the towel around the iron and rub the wax off the wall, it works. Water damage service in Alpine Utah, in this picture you can see that our customer left their garden hose on in the winter time and the water in the garden hose froze and backed up into the faucet that is connected to the house, then when it hits the valve it can't go any more so it breaks and the next time someone used that faucet it will flood the basement, because the break is inside of the home. So Just remember to always unhook your garden hose from your faucet when you are getting into the winter time. It is kind of a delayed reaction because it could be in the middle of the summer time, the next time you use that faucet and you are not thinking about the fact that you left the garden hose on the faucet in the winter time but the pipe is still broken. When you go to wash your car, you flood your basement. We are trying to give you a helpful tip on always making sure your garden hose is not connect to your home in the winter time. Here are some of the water damage jobs we have done lately. Remember, we only do one water damage at a time so we can pay more attention to your home. Many times we can take care of your problem for under your deductible so you will not have to make an insurance claim. We started our carpet cleaning business back in 1994. This is a family owned and operated business. Judy and I, Jeffrey Tobian are the ones that answer the phone and we are the ones that come out to your home to clean your carpets. When you call Alpine Professional Carpet Care, you are getting someone that has been to all the carpet cleaning classes and has been cleaning carpets for 30 years. We have all the up to date equipment and the knowledge on how to use the right equipment and products for the job at hand. We spend a lot of time protecting your home, by putting down tarps and blankets on the floor that we are not cleaning and Huggers and corner guards to protect the walls and railing in your home. We also put up a seal-a-door to keep it warm inside the home in the winter time and in the summer time it keeps the kids and pets inside the home and the bugs out. The reason we care so much is because you are calling the owners of the business and not just an employee. It is the little things that we do that are going to make a difference when we are carpet cleaning your home. If there is a spot in your carpet and we know what it is, we will have the product and will know how to get the spot out. 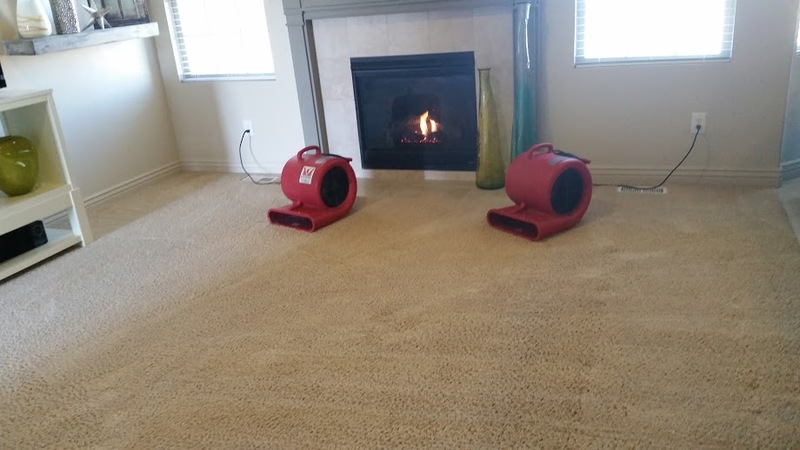 Not only will your carpets be the cleanest they have ever been but after we are done cleaning a room, we will set up fans to help the drying process. Getting your carpets clean and then get them dry. If you want something moved, there is two of us to move things and we have buckets of sliders to move your furniture and then we will put plastic tabs or styrofoam blocks under your furniture legs so the wood will not bleed on the carpet and the metal tabs will not leave rust spots on your carpet. We are great for problem solving your carpet cleaning needs. If you have some urine damage or a spot in your carpet, to cleaning your garage floor, give us a call and we will know what to do to fix your problem. We had a customer just moved into a place and the owner had the carpets cleaned and they are allergic to pets, they were having an allergic reaction and they called us. We re-cleaned the carpet and treated the carpet with an allergy treatment and fixed their problem. Every carpet is different, you need to use a different product on wool carpet, the PH needs to be between 6 and 9 and their are special products for cleaning olefin carpet because it is oil loving. Well, my point is every house I go about cleaning it differently because of different fibers and different soils need different products to clean with. Just like there is water soluble soil and non water soluble soil and you need to treat them differently. For an example dirt and oil are non water soluble soil and sugar is a water soluble soil. Getting an oil spot wet first, just makes it harder to get out. The important part of carpet cleaning: prevacuuming the carpet to pick up all the dry soil so when you prespray the carpet you do not make mud and then try to clean it. Using the right product for the right soil and fiber. Adding some agitation like when you are washing your clothes on a wash board or scrubbing the clothes together. Allowing time for the chemical to work and dwell, and heat so the chemical works faster and better. Setting the pile with a carpet cleaning rake, and last putting some dry equipment to speed up the drying process. If you you have pets that live in your home, why not have a carpet that is made for having pets. This carpet has a moisture barrier, so if your pet piddles on the carpet the moisture will not get into the pad and sub floor, making it easy to clean up. It is a non- absorbtion carpet and is durable and will look great for a longer time. It has a permanent built in soil and stain protection that will not come off when you get the carpet cleaned. They make this carpet so when you vacuum the carpet the pet hair comes out of the carpet easier. Just by looking at the backing you can see it is water proof. For more information check out Shaw, Mohawk and Stainmaster websites for pet friendly carpet. Getting a red spot out of the carpet. We were called to clean the carpets in this home because thier dog started eating the ginger bread house on the carpet and all the food coloring from the ginger bread house made a mess of the carpet. First thing you do is vacuum up as much as possible and then clean it the best you can. Then it will leave a dye stain in the carpet. There are a lot of products out there for this, Red Relief, Red One and in this case I am using Chemspec, Red X It. 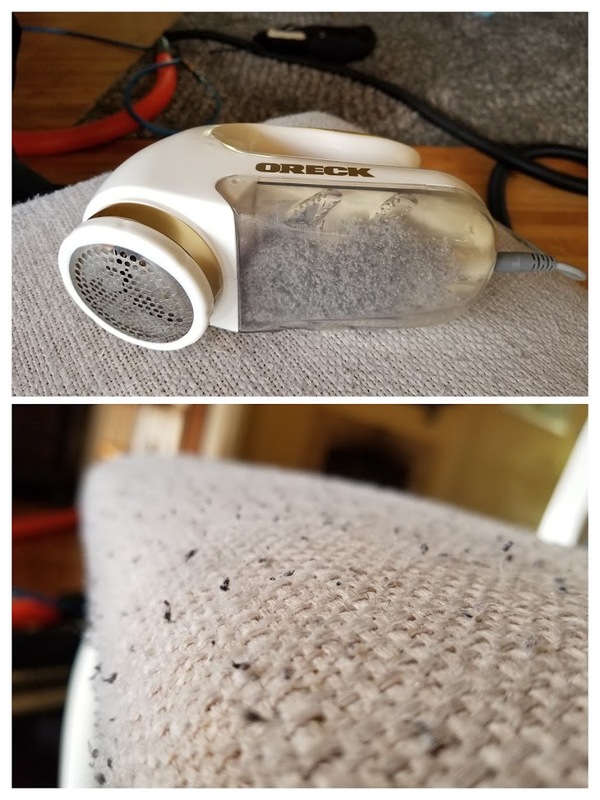 You can use a wallpaper steamer or a regular steamer. If you do not have a steamer you can get a white towel and get it wet and then ring it out and put a clothes iron on the steam setting. Make sure you fill the iron with water. Put the product on the red area and put the damp towel down and the iron on top of the towel to make the product steam. This makes the chemical work faster. These products are reducers and they have Ammonia in them and that is why I am wearing this mask. So we are trying to take out the color from the food dye and not take out the color of the carpet. It can be a little tricky. This is a before and after picture of the job we did. On this job it was a sports drink spilled on the carpet in this church. It took a while to get the red out of the carpet. When we get all the red out of the carpet, we rinse the carpet very well so the product does not keep working on the carpet. The first thing you do is to cut the top of the board, where the caulking is, with a razor blade also cut the corners so when you take off the baseboard you will not take off the paint with it. Then you take a finish pry bar and hammer it all the way down to the floor where it is against the two by four on the ground. Sometimes you can start it with a wide putty knife. Then you can pull the base board back enough to get a bigger pry bar in all the way to the floor so you are pushing against the 2 by 4, this way you will not put a hole in the wall. Start from the middle of the board and work your way to the ends of the board. Doing it this way you will find it pretty easy to take the base board off without breaking it. We take baseboards off the walls all the time. We put holes in the walls where the baseboards were to allow air into the walls to dry the walls and sometimes we inject air into the walls with tubes and an Inject-A-Dry system. When you call Alpine Professional Carpet Care, you are calling a family owned and operated business. We are a husband and wife carpet cleaning business, The Jeff and Judy team. It is just the little things that we do that are going to make it the best carpet cleaning experience you have ever had. We cater to all the little details because we care. We have been in business, cleaning carpets now since 1994. Well take a look at some of these videos and pictures and you can see how we can make a difference in your carpets when we are carpet cleaning. Pre scrubbing the pre spray in so important. Just take a look at this video and you can see how the right product for the right carpet and soil can loosen up all the soil in the carpet ready for the cleaning process. In this video you can see how an RX-20 works on the carpet. It just goes over and over until the carpet is really clean. It is like a clothes washing machine, just rinsing and cleaning over and over again with hot boiling water. It is like 5 carpet cleaning wands going over an area 100 times to make sure it is clean. It is so easy to use, I can run the RX20 with just one hand and in this video you can see the difference I am making on the carpet. Here, I am flushing the pet urine out of the carpet and the pad with my OSR water pail and a water claw. The water claw can retrieve the water from the pad right through the carpet. When I was done cleaning the carpet, I left fans and picked them up the next day and none of the carpet smelled like pet urine. I know because I was there the next day to pick up my fans. Here I am cleaning the carpet with a carpet cleaning wand. Can you see what a great job my wife and I are doing? Not just cleaning the carpets is important but making sure the carpet dries fast is also important. I always carry at least 10 fans in my carpet cleaning van. Here you can see after I clean a room, I setup a fan to start the drying process. Sometimes I clean the living room first and turn the fire place on so the carpet cleaning fans blow hot dry air across the carpet. On this job, this room was dry before I left this customer's house. We were cleaning the tile and the carpet in Orem Utah and this is some of the equipment, we use to clean with. Our water line is so hot, I have to use these lawn pic's to keep my water pressure line from burning the grass. When we are cleaning your carpets in Lindon, we will put up and Seal-A-Door to keep the bugs out of the house and the pets and children inside of the home. In the winter time it really helps to keep it warm inside of your house, so when I am done carpet cleaning a room my fans will work better if it is warm inside the room. Just think of a hair drier, heat and air movement is what dries the carpet. Then, we will do everything to protect your home, by putting down blankets and tarps on the floor we are not cleaning and putting corner guards to protect the walls of your home. Then we will pre spray your carpet and scrub it with a Brush Pro to break away any soil that might be in the carpet. You can see in this video, how the carpet is already looking better just by scrubbing the carpet. Then we will steam clean the carpet with our powerful truck mounted steam clean unit. As for truck mounts it is one of the larger truck mounts out there. In this picture can you see we are making a difference in the carpet we are cleaning. If you have some furniture that you want moved, just ask, Judy and I can move it and then move it back after we cleaned under the furniture and we will put plastic tabs and styrofoam blocks under the legs so the wood stain on the legs do not bleed on the newly cleaned carpet. We will do everything we can to protect the things in your home when we are carpet cleaning. . Here is a video of us carpet cleaning in Lindon Utah. Maybe you can take a look. Having the right equipment and products to clean with and the knowledge on how to use them is very important. I have been cleaning carpets for 30 years now so this is not my first walk in the park and most other carpet cleaners think I should be teaching classes on how to clean carpets. The fundamentals of carpet cleaning, CHEMICALS using the right product for the right fabric and soil in the carpet, TIME to let the chemical break down the soil, AGITATION they have been doing this for years when washing your clothes. Do you remember your mom rubbing your shirt together? And last TEMPERATURE, the hotter your water is the better your pre spray will work on the carpet to loosen up the soil. Can you see we are making a difference when we are carpet cleaning this home in Lindon Utah? Carpet cleaning service in Springville Utah. 801-756-2275 We have been cleaning carpets now in Springville Utah for over 20 years now , When you call Alpine Professional carpet Care you get my wife Judy or I on the phone and Judy and myself will be the ones that comes out to clean your carpets, i have been cleaning carpets now for 30 years and we have the best equipment and products to get your carpets the cleanest they have ever been since they were new. This is our carpet cleaning van and it has a very powerful truckmounted carpet cleaning unit inside the van. With a #5 blower and a heater 3,000 psi water pump it does a great job when we are cleaning your carpets. We also have a big van full of carpet cleaning equipment to make sure the job is done right, What other carpet cleaner carries 10 carpet cleaning fans in their van to dry the carpets with. Carpet cleaning in Provo Utah The important part of carpet cleaning is CHEMICAL, AGITATION, TIME AND TEMPERATURE. Lets start off with pre vacuuming to get all the dry soil out of the carpet so when you pre spray the carpet you don't make mud and then you would be trying to get the mud out of the carpet when you are carpet cleaning. Then you pre spray the carpet with the right chemical that fits the type of carpet you are cleaning and the type of soil that is in the carpet. This suspends the soil in a liquid form to make to make it easier to rinse away. Then allow time for the chemical to work. Adding some agitation by using a Brush Pro does a very good job when you are cleaning the carpets. Then last, the hotter the water is that you are cleaning with the better the chemical will work on the carpet. For every 18 degrees that the water is over 140 degrees the chemical will work twice as good. Then rinsing away everything is so important to make sure there is no soil and residue left in the carpet. Then setting the pile with a carpet cleaning rake really helps so when you set up your air movers or fans to dry the carpet, it will dry faster. You can see I have to use these lawn pics to keep my water line above the grass, so it will not burn a line in my customer's grass. Because my water is so hot, about 230 degrees. Pre vacuuming is so important, I use this this Sanitaire vacuum. This is what a Brush Pro looks like. 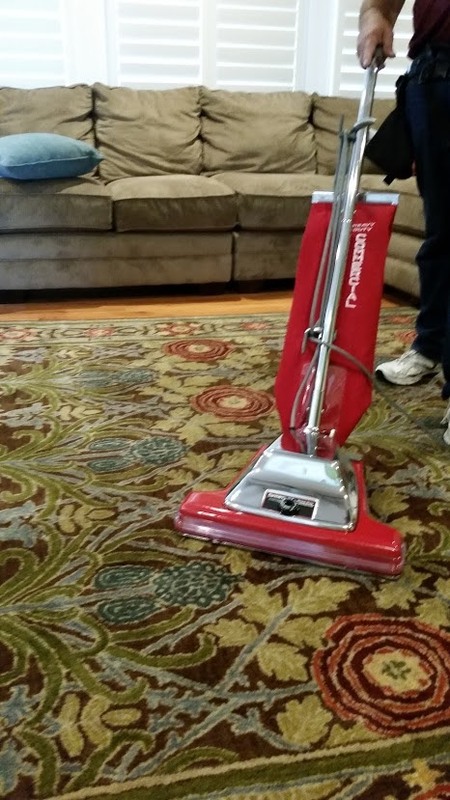 It has two large brushes that counter rotate and any debris that is in the carpet, like pet hair, the brush with pick it up and put it in the bins. In this short video you can see, if done right, how important it is to clean and rinse away all the soil and residue in the carpet. Can you see what a difference we are making on this carpet, when we are carpet cleaning this home? We always set up air movers to dry the carpet. When we turn the fireplace on it will blow hot air across the carpet so the carpet will dry really fast. Just think of a hair dryer, heat and air movement is what dries the carpet.